F1 – Labradoodles made up of 50% Labrador Retriever and 50% Poodle. This is considered a first generation cross and produces the healthiest offspring. The coat can either be a shedding or non-shedding coat, and may appear smooth like a Labrador, wirey like an Irish Wolfhound, or have a shaggy/wavy appearance. This particular cross is not the best choice for those who have dog allergies. F1-B – For this cross, Labradoodle breeders breed an F1 Labradoodle and a Poodle (Approximately 25% Labrador and 75% Poodle). This breeding produces the Wavy/Curly coat Labradoodle breed. This coat does not shed and has the highest potential of being hypoallergenic. F2 – Theses are Labradoodles produced from two F1 Labradoodles. The resulting Labradoodles are very similar to the F1 breed, and are more likely to have a coat that sheds. F3 – This is when two F2 Labradoodles are crossed. They have similar characteristics to the F2 breed. Multi-generation – This last type of breeding is when two F3 generation or higher Labradoodles are bred. This is usually the way Australian Labradoodle breeders breed the dog. You need to find out which breeding method a breeder uses. You also need to ask the breeder why they chose this particular method of breeding, and what you should expect from the puppies produced. Finally, remember that the best way to determine the temperament and characteristics of the resulting pups is by investigating both the Labrador Retriever and Standard Poodle breed. 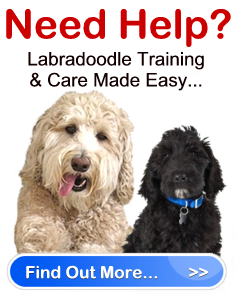 Make sure you ask all Labradoodle breeders about the sire and dam of the litter. If the sire and dam happen to be Labradoodles, find out about the heritage of the Labrador and Poodle that were originally used to create the initial hybrid.